How to Sync iCal with iPhone? "I have duplicate songs on both my iMac and iPhone 5S. I know there’s solution to figure out how to delete duplicate songs with iTunes and iPhone 5S respectively. However, it is quite troublesome as I have to delete duplicate songs on iTunes or iPhone 5S one by one. I need an easier way that could let me delete duplicate songs for iPhone 5S in batch. Is there any way?" If your iTunes application on Mac have updated to Version 11+, you can use the method Apple supported to show all duplicate items in your iTunes library. From the menu at the top of your computer screen, choose View > Show Duplicate Items. And then manually delete unwanted ones. Or if you are a Windows user, Hold down the Control and B keys on your keyboard to open the iTunes menu bar. Choose View > Show Duplicate Items. Matches are based on the song name and artist. If you have multiple versions of the same song (for example, live and studio versions, or versions from different albums), hold the Alt or Option key (Mac) or the Shift key (Windows) and choose View > Show Exact Duplicate Items. This will show only the duplicate songs that have the same name, artist, and album. The information in the other columns, such as Time, Release Date, or Genre, can also help you determine which item to keep and which to remove. For example, the Plays column shows which version of the song you’ve listened to more. Duplicate songs on iPhone/iPad/iPod not only take a lot of space, but also affect music enjoying. If you prefer to delete duplicate songs for iPhone/iPad/iPod in batch, you would better turn to Leawo Tunes Cleaner for Mac, a professional Mac iTunes duplicate remover program that finds and removes duplicate songs for iPhone/iPad/iPod from iTunes on Mac in only a few clicks and in batch. Follow the below guide to know how to delete duplicate songs from iTunes for iPhone/iPad/iPod on Mac. If you are iPhone 6s/6s Plus users, the method also works with your modes. Ahead of cleaning, you need to sync your iPhone/iPad/iPod music files to your iTunes on Mac computer via data cable and then clear your iPhone/iPad/iPod music library. Also, install Leawo Tunes Cleaner for Mac on your Mac computer. Kick off Leawo Tunes Cleaner for Mac. On the main program interface of this iTunes duplicate remover, you could see 4 different options. Click the "Clean-up Duplicates" option. Set Quick Scan or Deep Scan as duplicate scanning mode on the left side of this program. On the bottom of this iPhone duplicate remover, click "Scan iTunes" button to let it scan duplicate songs in iTunes music library on Mac for your iPhone/iPad/iPod. 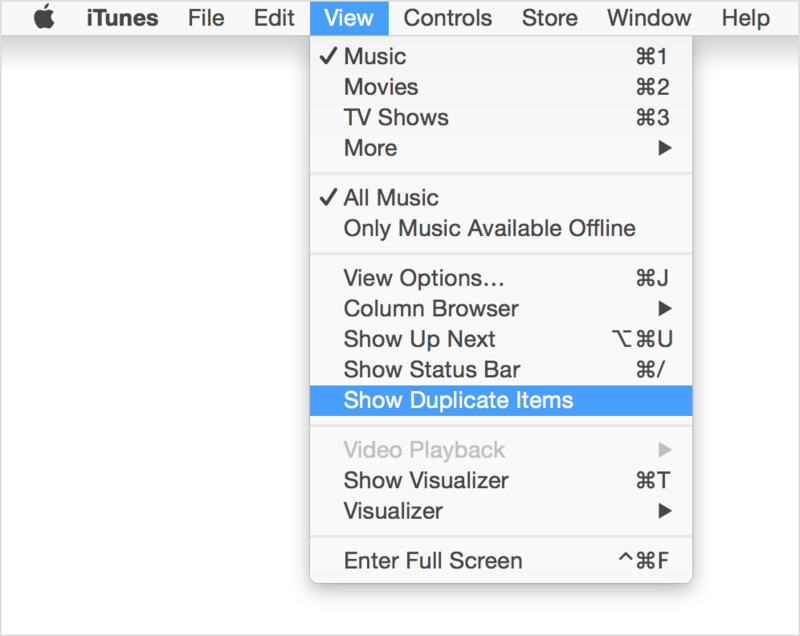 Preview and select duplicate songs, then click "Remove" button to let this iTunes duplicate remover delete duplicate songs for your iPhone/iPad/iPod from iTunes. After you click the "Remove" button, this iTunes duplicate remover would start removing duplicate songs for your iPhone/iPad/iPod devices immediately. Then, you only need to connect your iPhone/iPad/iPod device to your Mac computer and then sync the fixed iTunes music library to your iOS devices. No duplicate songs would exist now. Notes: Leawo Tunes Cleaner could help Windows users easily and effectively find and remove duplicate songs in iTunes for iPad, iPhone or iPod devices on Windows XP/Vista/7/8/8.1/10. You could also use this iTunes duplicate remover to download and add song tags to your iTunes music files, including artist, album, artwork, etc. Leawo Tunes Cleaner for Mac is a wonderful iTunes cleanup program for Mac users to tidy and re-organize their iTunes music library and music collections on portable devices like MP4 player, iPod, etc. With an iTunes duplicate remover included, it could easily find and delete duplicate songs in iTunes music library for iPhone, iPad and iPod on iMac or Macbook. Acting as an iPod duplicate finder and remover, Leawo Tunes Cleaner could assist you to easily find and remove duplicate songs in iPod from iTunes on Mac. The below guide tells you how to delete duplicate songs from iTunes for iPod on Mac.